Shanghai is even more magical by night and this 3.5-hour tour ensures an unforgettable evening in the city. 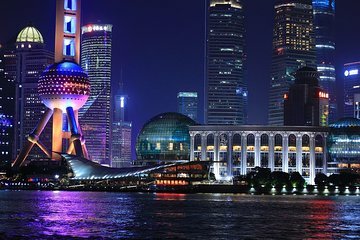 Tuck into a delicious dinner at a Thai restaurant, enjoy a VIP Huangpu River cruise, and marvel at illuminated landmarks such as the Shanghai Tower, Pearl TV Tower, and the Peace Hotel. Private hotel pickup and drop-off is included. Highly recommend this tour. Our tour guide Berlin, is a lovely, personable and knowledgeable young woman and our evening was a lot of fun. The restaurant choice was excellent and our view on the boat in the VIP area was fabulous. Shanghai at night on the river is amazing with all the buildings beautifully lit and a sight not to be missed. I highly recommend this tour and would do it again. Our Tour was an excellent one. We as group are totally satisfied with the final result and the way the problems were solved. Thanks again and congratulations.